A Jawsaphone is made from a Jews Harp and a trumpet bell. These are hand-made brass jaw harps (jews harps) and Jawsaphones made by Clayton Bailey. This hand-made jaw harp is made from 1/8" heavy brass stock and has a spring steel tongue. The tongue is held in place by two machine screws and a clamping plate. This allows the tongue to be adjusted or replaced, if necessary. 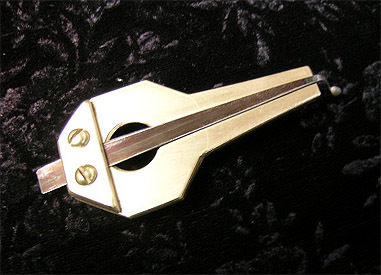 The double- tongue jews harp has a unique vibratto sound., but it's not as loud as the single-tongued jews harp shown at the left. 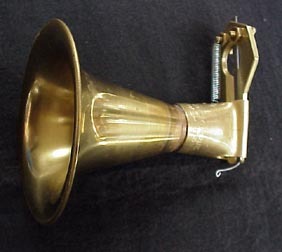 A Jawsaphone is made by attaching the jaw harp to a trumpet bell. The trumpet amplifies the sound of the harp without the use of electricity, and gives a unique sound to the instrument. The Jawsaphone is played by placing it lightly against the lips. 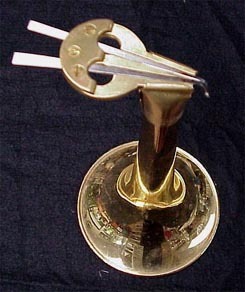 In these experimental instruments, the jews harp can be removed from the bell, and played separately because it is held in place by a small spring. This Jawsaphone amplifies the sound of this experimental double- tongued jews harp.